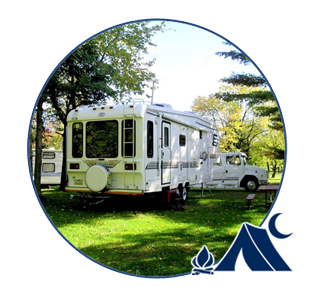 Encompassed by forty acres of tranquil and wildlife rich wilderness, our campgrounds will provide you with the Upper Peninsula vacation that you have been dreaming of. Our Upper Peninsula Rental Cabins and Little Lodge give our guests all the comforts of home. 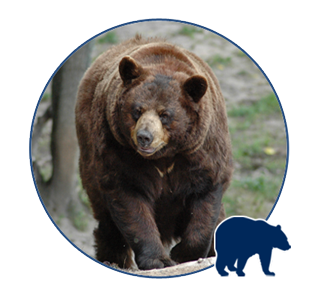 We offer a variety of UP Lodging that is clean, comfy and spacious..
Our location is perfectly situated in the middle of some great Upper Peninsula Attractions ranging from the Tahquamenon Falls to Oswald’s Bear Ranch. 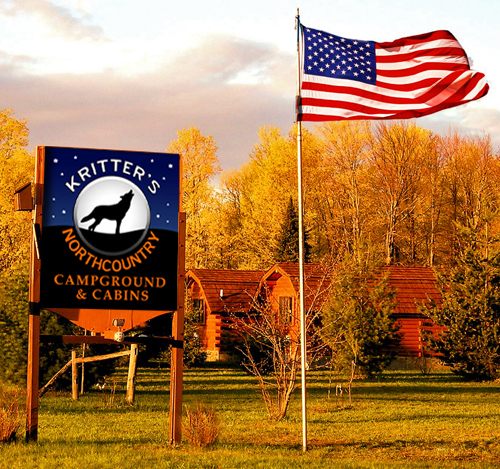 Welcome to Kritter's Northcountry Campground & Cabins of Newberry, Michigan. We are conveniently located in the heart of Michigan's Upper Peninsula and centrally located close to many Eastern Upper Peninsula attractions. We take pride in our well-maintained campground and facilities; from keeping the bird feeders filled to protecting the many species of trees found in the campground. We offer a wide variety of Upper Peninsula accommodations and camping sites. We cater to groups, family and friends. Please visit the events page for current and upcoming activities. We invite you to, "Make your destination our location." Encompassed by forty acres of tranquil and wildlife rich wilderness, our campgrounds will provide you with the Upper Peninsula vacation that you have been dreaming of. We are seasoned campers and have a great respect for Mother Nature. 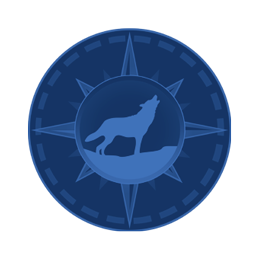 We have put that part of ourselves into our Upper Michigan Campground and are able to offer you modern & rustic camping in a natural wooded setting. Our scenic Newberry, MI Campground offers guests fifty large, spacious grassy pull-through sites surrounded in stands of poplar trees and white pines. We own & operate a family park and we are committed to providing our guests with a safe & secure stay. 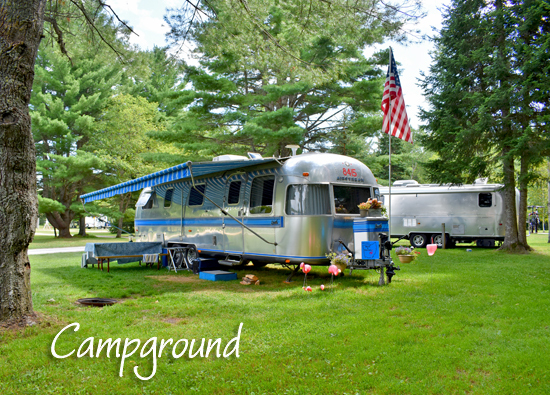 Visit our Upper Michigan Campground page to learn more about our property. Our Upper Peninsula Rental Cabins are similar to 'camping cabins' only larger and with more comforts. One room has a full size log bed and the other smaller room has a log bunk bed. All bedding is provided, you bring your towels and personal items. The cabins also have a small table and chairs, microwave, fridge, 12-cup coffee maker and toaster. 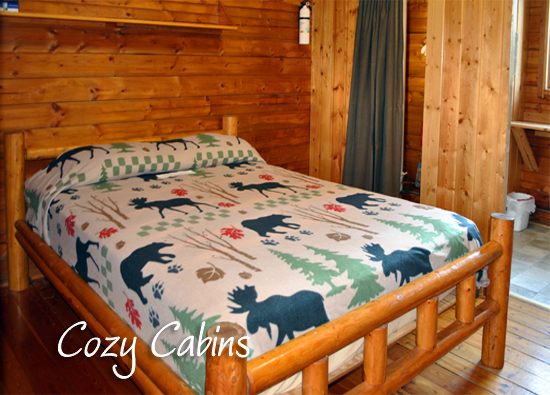 Cabin guests have full use of the campground facilities such as the nature trail, play areas, laundry facilities, etc. 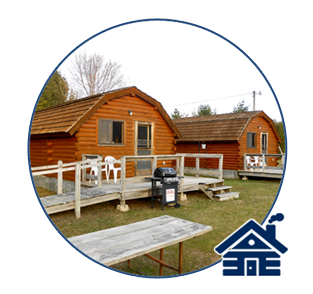 Visit our Upper Peninsula Rental Cabins page to learn more about our property. Our Upper Peninsula Vacation Rental gives visitors their own private retreat complete with a gas grill and picnic table. Little Lodge's furnished kitchen has plenty of cupboards, microwave, 12-cup coffee maker, toaster, table service for 6, and many more amenities. Pots and pans are provided as well. Relax in privacy of our lodge or mingle with guests in the campground. Guests of the Little Lodge have full use of the campground facilities. Deck has a ramp for handicap access. 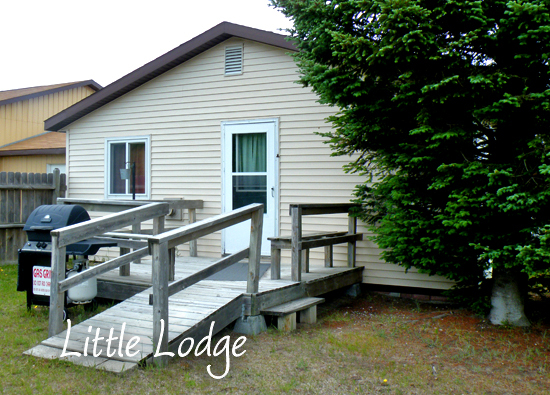 Visit our Little Lodge - Upper Peninsula Vacation Rental page to learn more about our property. 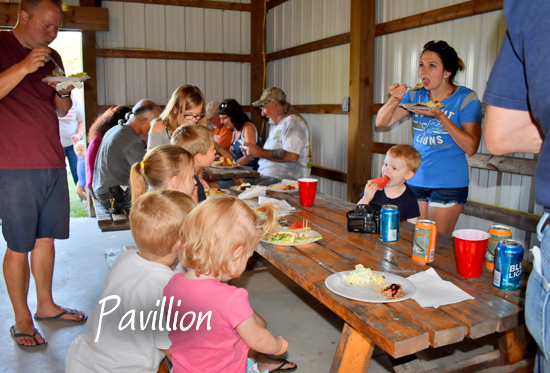 Along with the convenience of our central location, you will also be pleased to learn that our Upper Michigan campground amenities include a large enclosed pavilion that provides our guests with a great place to enjoy family reunions and group gatherings. We also have play areas for the youngsters. Enjoy a spectacular sunrise or a berry-picking stroll through our scenic woods, or just sit and listen to the many birds found in the campground. A bird-viewing deck is available for our guests. During the summer and early fall months you'll be treated to up close viewing of hummingbirds as well as other species of birds native to our area. We believe you'll be glad that you made our location your destination! The Eastern UP, also known as Tahquamenon Country, offers a wide variety of Upper Michigan attractions and activities that are family friendly, affordable and adventurous. There is so much to experience all within one hour of Kritter's Northcountry Campground & Cabins. Our featured attraction is the Upper Tahquamenon Falls. This unique EUP attraction is located along the Tahquamenon Scenic Heritage Route and is a great treat for people of all ages. The Upper Falls are special in many ways. It is the second largest waterfall east of the Mississippi, with Niagara being the largest. 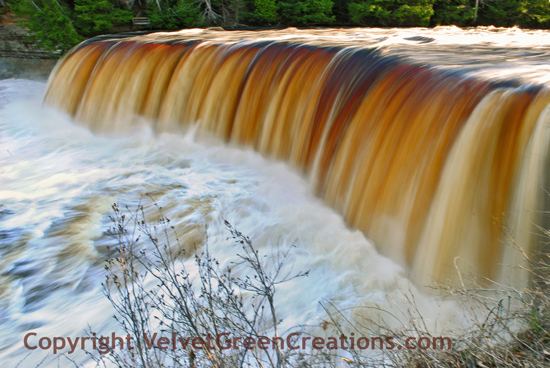 The Upper Tahquamenon Falls is over 200' wide and 48' high. Over 50,000 gallons of water spill over this incredible waterfall per second. The beauty of this area is a must see when you are making your Upper Michigan travel plans. Remember to grab your camera, the view is incredible and the park's wildlife and birds abound throughout the entire state park. Migrating birds using Whitefish Point to enter or return from Canada, pass through the park every spring and fall. More than 300 species, including the rarities, have been documented using this migration corridor. When you watch this amazing video, you will be taken high above the Upper Tahquamenon Falls with a view like none other. Our spring flow can send over 50,000 gallons of water over the falls from the Tahquamenon in one second. This has been an amazing spring and DJ's video paints a unique picture. We invite you to watch and come visit our great Upper Peninsula. The Lower Tahquamenon Falls attracts people from all over the world. Each year more than 500,000 visitors come to the Tahquamenon Falls State Park to explore the Upper and Lower Falls along with over 40 miles of hiking trails. The Lower Falls is amazing with its small cascading waters that people love to come in play in. In essence, it is like a natural water park! Superior Sights invites you to come and experience the beauty of natural wonders of Michigan's Upper Peninsula. We look forward to seeing you here! Kritter's Northcountry Campground and Cabins is a member of the Good Sam Camping Club. Our standards meet those of the Good Sam guidelines. We welcome all of our Good Sam Campers to our park! Go West on M-28, turn right on M-123 North at the Sunoco and Quality Inn at the Newberry Junction. Follow M-123 North 10 miles. Spring and summer office hours for phone calls and emails is from 8 a.m. to 9 p.m. Fall office hours are from 8:00 a.m. to 7:30 p.m. Winter hours are from 9 a.m. to 6 p.m.